Editor’s note: While Pure Chess is available for both PS3 and PS Vita, this review focuses on the Vita version. I’m a big fan of Hustle Kings, specifically the asynchronous message play multiplayer found in the Vita version of the billiards game. When I heard that the same development house, VooFoo Studios, was working on a Chess Game with a similar mechanic, my interest was immediately piqued. While the chess pieces in Pure Chess are just as gorgeously rendered as the beautiful balls in Hustle Kings, the “play by mail” functionality just doesn’t quite deliver the same oomph. That’s not to say Pure Chess is a bad game – far from it. The chess board, the pieces, and the background environments are all quite well rendered and the accompanying music is comfortable and innocuous without ever becoming annoying. These inoffensive tunes come from four different genres – which the game refers to as “classical”, “jazz”, “chill”, and “nature” – and each genre can be individually toggled on or off. The menu system is straightforward and simple to navigate with either touch or buttons. My biggest complaint about the game is really more of an unavoidable reality of the nature of the game of chess. My most-anticipated feature was the asynchronous multiplayer, where one player makes one move, then sends off a PSN message to their opponent saying “your turn, dude”. Upon receipt, whenever that may be, the opponent does the same and the cycle repeats until the game is won. In Hustle Kings, this process is fun and engaging because any time you sink a ball, you’d get to take another shot. Likewise, you’d get to watch the replay of your opponents shots before taking your own. Here in Pure Chess, every single turn is always a one-move affair, making the whole thing somewhat anti-climactic once you’ve gone through all the trouble of loading up the game and checking your messages. If you leave Pure Chess running on your Vita in perpetuity, it’s not so bad, but if you play other games (or use Facebook, or Content Manager) and quit out of Pure Chess, the entire process just ends up feeling a bit too cumbersome for moving a single chess piece. I’m still glad that ‘play by mail’ is in the game, as it is definitely a welcome feature, but the Vita’s one-game-at-a-time structure and the basic rules of chess combine to create conditions that are slightly less than perfect for asynchronous play. A real-time multiplayer mode could have made for a more seamless, albeit lengthy, experience, but no such mode is found here. Those issues are hardly VooFoo’s fault though. They’ve done a bang-up job of making a really solid chess game. The tournament play provides a nice challenge, as do standard one-off exhibition matches against AI. A tutorial mode is included that teaches everything from basic rules all the way up to advanced tactics. I’m no expert by any stretch of the imagination, but I even learned a couple of more obscure rules that I wasn’t aware of, like “castling” and “en passant”. If you’ve got a friend or loved one around, there’s even a pass-and-play mode for playing 2-player matches locally on one Vita. The included ‘bonus games’ work like a puzzle mode of sorts and can be quite the brain teaser. You are presented with a particular placement of pieces and are tasked with finding the solution to reaching a checkmate in a certain number of moves. They aren’t a radical departure or anything, but the added variety is welcome. All in all, Pure Chess is a great chess game, but the lack of a true real-time multiplayer mode and the inability to initiate an asynchronous match with a stranger hold it back from being a truly exceptional one. 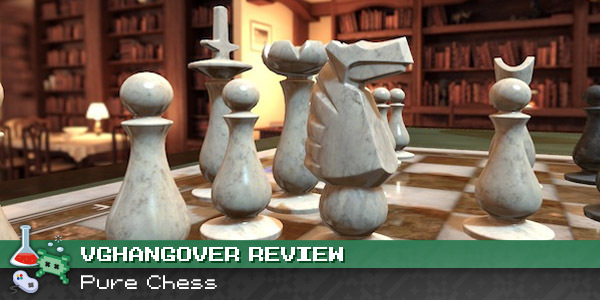 This review is based on the PS Vita version of Pure Chess. A copy of the game was provided to VGH by Ripstone.